William Lahey became the 25th President and Vice-Chancellor of the University of King’s College on July 1, 2016. A professor and former provincial Deputy Minister, Lahey received his undergraduate arts degree from Mount Allison University, followed by degrees in jurisprudence from Oxford University, where he was a Rhodes Scholar, and a Master of Laws from the University of Toronto. Throughout his career as a legal scholar and senior public servant, President Lahey has worked at the boundaries between law and other disciplines: history, political science, public administration, economics, health policy and environmental management. President Lahey began his career as clerk for Mr. Justice La Forest of the Supreme Court of Canada and later practiced with the Halifax firm of McInnes, Cooper & Robertson. 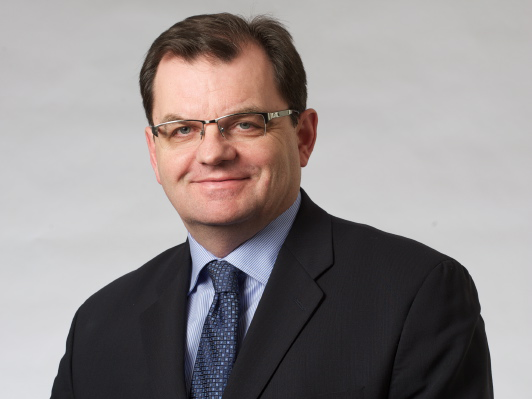 After eight years in the Nova Scotia public service, including as Assistant Deputy Minister of Health, he joined the faculty of Dalhousie University’s Schulich School of Law in 2001, where he remains an Associate Professor and where he served as the Director of the Dalhousie Health Law Institute between 2007 and 2011. His research spans the fields of administrative, constitutional, health, environmental and regulatory law: a list of some of his scholarly writings can be viewed on his Dalhousie faculty profile. He has been honoured for teaching excellence by Dalhousie law students on three occasions, in 2004, 2008 and again in 2015. During his public service career, President Lahey was responsible for legislative reform in a number of areas, including workers’ compensation and occupational health and safety, labour relations and labour standards, health system and health professions legislation, and environmental law. In 2012-2013, he worked again with Mr. Justice La Forest to complete a major review of Nova Scotia’s mental health legislation. As Deputy Minister, Department of Environment and Labour from 2004 to 2007, President Lahey spearheaded the development of the Environmental Goals and Sustainable Prosperity Act, a far-reaching piece of legislation designed to improve environmental law and policy and to make Nova Scotia a leader in integrating economic growth and environmental protection objectives. He later co-authored a highly-regarded review of the province’s aquaculture industry, recommending significant changes to its regulatory framework in accordance with the principles and concepts of sustainable prosperity. President Lahey played a leading role as Board Chair in the founding of Efficiency Nova Scotia, which operates today as EfficiencyOne, Canada’s only regulated energy efficiency utility. It is largely responsible for Nova Scotia’s nation-leading success in reducing electricity use and greenhouse gas emissions through energy efficiency programs. President Lahey has also served as Chair of the Board of Directors of the Nova Scotia Health Research Foundation and as Chair of the Board of Directors of the Canadian Centre for Ethics in Public Affairs. Today, President Lahey continues to be called upon to advise on some of Nova Scotia’s most challenging public policy issues, having just completed an independent review of the province’s forestry practices which emphasizes protection of ecosystems and biodiversity.